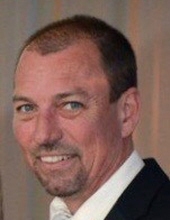 Jay P. Boward, 57, of Ellsworth, passed away 5:05 p.m. Monday (April 1) at Northwestern Memorial Hospital in Chicago. His visitation will be Saturday, April 6, 2019, from 3:00 p.m. - 5:00 p.m. at Calvert-Belangee-Bruce Funeral Home, Le Roy, Illinois, with David O’Neall officiating a Celebration of Life service immediately after. There will be a burial of his ashes at Dawson Cemetery, rural Ellsworth at a later date. In lieu of flowers, memorial contributions should be made to Northwestern Memorial Hospital, Shirley Ryan Ability Lab, Leukemia and Lymphoma Society, or to the family care of Amanda Bane. Jay was born November 4, 1961, in Lincoln, IL, to Louie and Myrna (Marten) Boward in Lincoln. Surviving are his mother; two children, Amanda (Tobey) Bane of Ellsworth and Kyle Boward of Downs; two grandsons, Ian and Evan Bane; brother, Scott Boward; sister, Marcy (Curt) Jones; many nieces and nephews; and two very dear friends, Eddie Peavler and Marvin Ney. He was preceded in death by his father and one brother, Todd Boward. Jay was an avid NASCAR fan, a Cubs fan and a fisherman. He frequently made fishing trips to Montauk State Park in Missouri, and loved to attend races. He was also a master grill chef. Jay was diagnosed with Plasma Cell Leukemia in 2014, and had been in remission since 2015 after receiving a Stem Cell Transplant from an anonymous donor. Jay continued to battle medical problems throughout the past few years and now his body can finally rest easy. The care provided by his doctor (Dr. Jayesh Mehta) and the team at Northwestern Medical gave his family 4.5 more years with him, where he was able to watch his kids graduate college and grandsons start school. Jay could brighten any room with his smile and friendly personality. He could lighten any situation with a wink, a smirk and a classic one liner. His sense of humor spread even into his hospital stays. He will be greatly missed by his family and friends. "Email Address" would like to share the life celebration of Jay P. Boward. Click on the "link" to go to share a favorite memory or leave a condolence message for the family.